Artistic Outpost is releasing two new stamp plates. 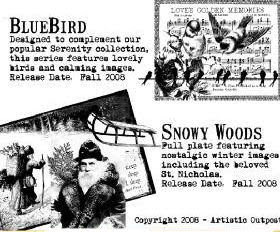 Snowy Woods and Bluebird will be available on October 1st. 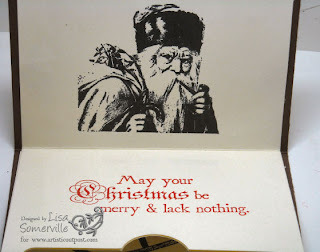 The Christmas plate this year, features peaceful images of a loving Santa Claus who we believe is the real one. No mall Santa's helpers here!!! This is a full 8.5 x 11" unmounted stamp collection. Loads of beautiful images, and Artistic Outpost's first "full" plate. The Bluebird collection is once again the half plate size of 8.5 x 5.5". It is meant to be your solace this winter. You can see the reflections of winter and spring all in this one collection. Our peaceful collection of bird inspired images to take you through to spring. Bundle Specials on these plates will be posted on October 1st, on the Artistic Outpost Blog. 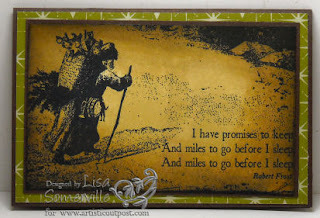 Today I'm showing a double sneak peek - as I've used the Gift Card Holder directions from the October TJNL, along with images from Artistic Outpost's Snowy Woods plate. Wow! Thanks for the inside view too, very creative. Oh Lisa I like these! I love the cards you made. Very cool stuff, Lisa! 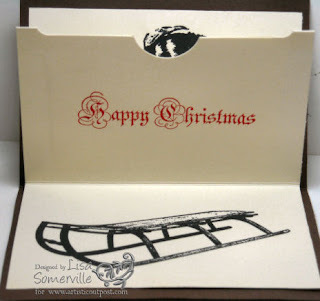 The gift card holder is neato! It was so great to meet you at the Chicago show.I love the "miles to go" Santa, never would have thought to use that color, wonderful!